If emergency towing is necessary, we recommend having it done by an authorized Kia dealer or a commercial tow-truck service. Proper lifting and towing procedures are necessary to prevent damage to the vehicle. The use of wheel dollies (1) or flatbed is recommended. 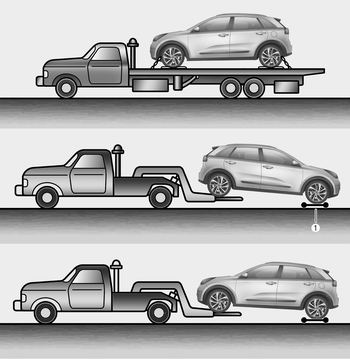 On FWD vehicles, it is acceptable to tow the vehicle with the rear wheels on the ground (without dollies) and the front wheels off the ground.